Quite a few posts ago I wrote about what it was like to come out of the metaphorical closet and declare that I was leaving the service. With that announcement my career, which up to that instant was a successful one and filled with opportunities, was over. I stepped onto the platform and watched the train continue down the tracks with my peers and friends continuing to ride the rails of a dynamic career. 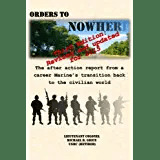 Some went to the Pentagon, others to the various War Colleges, and no small number headed out for places exotic or dangerous depending on which spot on the globe they ended up. With a sigh I waved goodbye and wished them well. Why did I do it, then? Why did I step off the train? My career was moving upward and I was very well respected in my field. To parapharase Marlon Brando’s Terry from On the Waterfront, I coulda been a contender for promotion and the plum assignments that lay just down the line. Why leave? It is a truly complicated question with an answer that I am not sure I have fully come to grasp yet. There was no singular event or crisis that drove me out. There was no enticement from the outside world that drew me away. As I wrote earlier, I woke up one day to the realization that it was time to go. Leaving, however, is not that simple. The time I chose to depart the Marine Corps coincided with the end of the best job that I had during my career- being the Commanding Officer of a combat unit in time of war. I had been competitively selected to lead a highly trained and specialized unit of Marines and Sailors, and to take them into combat. It was an incredibly demanding and challenging assignment, but it was the most rewarding thing that I had done in my 27 or so years of wearing green. It is addictive being in command. I had been fortunate to command five different organizations at various levels during my career, and each time I handed the flag to the next guy was a significant emotional event. My last command, however, was the most momentous because I was selected to take charge by a board of senior officers and my orders came straight from the Commandant of the Marine Corps- the top Marine himself. I was one of the lucky few who was able to command; less than one in five officers are selected to do so at my level. For a career Marine a successful command tour is a harbinger of things to come- promotion, top level schools like the National War College or a fellowship to a prestigious university like Harvard, and the possibility of command again in the future. For officers who aren’t selected to command, however, those opportunities are less likely. Being picked opens doors for your career that for others remain forever closed. Assuming command is also assuming a debt. A debt to the Marines and Sailors that you lead as well as to the Marine Corps writ large. After all, if you are selected by definition you are in the top of your peer group. The expectation of our most senior officers and no small number of my peers is that you, the one entrusted with such a critical and rewarding position, will give back to the Marine Corps and repay the debt incurred by being given the most important job there is- leading our young men (and women) in the defense of our nation. Since I chose to depart active duty when I handed the flag to my successor, however, no small number of Marines viewed my departure with disdain. In their minds I had taken the best job but not repaid the debt that it incurred; I had in essence eaten dessert and skipped clearing the table and doing the dishes. In their minds I was selfish. I agree that assuming command incurs a debt. The trust and confidence in a commander is nearly absolute; he or she is entrusted with the lives of our youth and with the defense of our nation. Command is also a crucible of sorts. The commander leaves command a different officer because he or she has learned lessons only imparted by such a demanding job. Many are positive, such as the satisfaction and pure joy you experience when your Marines do well and your unit succeeds. Many are negative, such as when you or your unit fails. Command means being on duty 24/7 from the day you take the flag to the day you pass it on- complete with midnight phone calls because one of your Marines is in the brig to meeting the casualty evacuation helicopter at the field hospital when your wounded Marines are brought in from the fight. Command tempers an officer as a furnace tempers steel, and it is for this reason that the doors I wrote about earlier spring open. A debt is indeed owed, and I am a firm believer in paying my debts. In my case, I paid my debt up front. The debt is one that I have not been alone in discharging. My family has paid an enormous price throughout my career, but in particular the wars in Iraq and Afghanistan have taken a disproportionate toll. I have deployed a lot. That isn’t unusual for a Marine particularly in time of war, but in my case the deployments were punishing. I deployed to war four times in a five year span of time; again, that isn’t as much as some, but certainly more than most of my peers. I have young children (currently ages 11 and 8), and the things that I missed are utterly irreplaceable. Little things like my oldest sons 6th, 7th, 8th, and 10th birthdays. Little things like being gone either in a combat zone or preparing for the fight for over half of my youngest son’s life by the time he hit seven years old. Countless holidays-Thanksgivings, Christmases, Easters, Halloweens- spent in a foreign country while my kids open presents or trick or treat without their father. The worst bit was coming home from deployment when each of my kids was little, though. It is an incredible punch to the gut when you step off the bus and your kids don’t know who you are because they were too young when you left to remember that you even exist, and in my case it happened with both of them. My kids paid their part of my debt. When I wasn’t deployed I was in the field training or off at some conference somewhere. My wife, who has an incredibly demanding career of her own, held it together despite my absence. Parent-teacher conferences, trips to the doctor, homework, sports, and everything else that parents do fell to her, and she soldiered on and made it work. She paid her part of my debt. So on that fateful day when I woke up and realized it was time to go I did so with a clear conscience. The debt had been repaid by my entire family: I had spent 30 out of 60 months drawing tax-free pay for being in a combat zone and my family supported me and kept it together despite the crushing demands that deployments bring. I do not feel that I have not repaid the Marine Corps for the privilege of command. This entry was posted in Transition Posts and tagged active duty, Officer, Retirement, transition. Bookmark the permalink. Mike, very well put. It’s ultimately difficult to leave active duty; we never stop being Marines, but the inability to serve, in that serious and genuine capacity, is a challenging loss. Sooner or later, everyone has to leave the Marine Corps. You did it the best way possible – at the end of a terrific career, with your health, and into the arms of a loving family. Congratulations, Marine. An incredible account from an incredible man and marine. My hat is off to you and all who serve to protect our nation. We owe it to you and all in the service to be worthy of such devotion. Thanks so much for the note- my trials pale next to the challenges you have faced, and your ever-positive attitude is an inspiration! Mike, you have paid your debt, and you have chosen the best course of action. I realized the cost too late and it cost me my marriage. I know you will deny this, but you are a hero and I teach that to your neice and nephew. Thank you for your service, and your service is more honorable and admireable than many. Godspeed in the most important and challenging jobs the Lord has given you; being a husband and father. Great to hear from you! Thanks for the kind words. Thank you for your service- amazing how time flies! Give my best to TJ and Amanda, and stay safe! Great to see you again this week Mike, congrats on retirement and the site. I have found my niche as well as polictics/school. Writing! What a great hobby after retirement. We need to catch up and invite HAGAR and partake in a beer ot two! Semper Fi Brother….. I agree. Writing is a great hobby to have! We’ll definately have to get the band back together…. Mike- I have the utmost respect for you and your decision. You left active duty on your own terms and for your own reasons and priorities. The Marine Corps has an amazing ability to make you feel guilty about leaving, and certainly the loss of a blue-chip officer like has an impact, but in the end the institution is more than one person and it will continue to prevail. I saw what you did in Ramadi for 2/28 BCT and no doubt you earned your command. Consider your command tour a reward for all your stellar contributions over the course of your 27 years. Thanks for the post! It really means a lot. Hard to believe that our time in Ramadi was that long ago- over five years. I really appreciate your comments- they truly mean a great deal!